Unfortunately the rest of February was filled with sickness in our house. What is it with February that wipes everyone out every year? My hubby is down and out right now with what I think is influenza, I’m typing while slumped in the chair with body aches, and my youngest has double ear infections and just got over bronchitis. All I can say is, “Bring on March!” I can’t wait until I can open up windows and do some spring cleaning! To cheer me up, I enjoyed looking back at some of my favorite things from the month. I hope you enjoy reading them too! Homemade Hot Chocolate from Gimme Some Oven – I love hot chocolate, and have been looking for a good make-at-home recipe for a while. I just made a batch of this today and absolutely LOVE it! After I hit the publish button, I’m going to go refill my cup! Gluten free Wonton Soup from Gluten free on a Shoestring – I would love a bowl of this!! Gluten free Banana Bread Doughnuts from The Baking Beauties – The icing she chose sounds just perfect with these! Dairy-free Instant Frozen Berry Yogurt from Sarah Bakes Gluten free Treats – This looks so cool and refreshing, yet easy to make! Spinach and Artichoke Dip Parmesan Cups from Diethood– I love this combo and can’t wait to try making these! The Parmesan Cups are amazing! This super cute shirt that I’d been wanting for a while that says “Shopping is My Cardio”. My hubby is in a book club where they are reading through a different C.S. Lewis book each month, so I bought him The Complete C. S. Lewis Signature Classics . It is a great way to get 6 of his classic books for a great price. My boys, and even my hubby, are huge fans of the video game Minecraft, so I bought this book for my son’s birthday and they’ve all been reading it: Minecraft: Essential Handbook: An Official Mojang Book . They all gave it a thumbs up! I stocked up on my favorite gluten-free pizza crusts this month. I buy my crusts from a dedicated gluten-free bakery that is a couple of hours away from me called Cloverstone Bakery. Their products are available in my town at Whole Foods and Rosauers. Their pizza crusts are really good, but they do have dairy and almond flour, so not suitable for those of you with those allergies. I pull out two frozen crusts to make Friday nights be pizza night at our house. I love the ease and the taste/texture of these crusts! My kids are crazy about the new Lego Movie minifigures. I bought at least a dozen this month so far to give as presents, party favors and rewards. They LOVED the Lego Movie too! We definitely recommend it! I’m finding them at local stores for about $2.50-$3.00. I’m totally in agreement with Gluten Dude’s response to a ridiculous article about classroom treats and food allergies. As my kids are growing up, and we’re long past the stages of diapers, sippy cups and play dates, I really enjoyed reading this article, “Dear Lonely Mom of Older Kids“. I could relate to a lot of it already, and can see how applicable this is for me in the coming years. Whether you are a blogger, lead a group of some sort, or dare to participate in and read the comments on online newspaper articles, these 10 words that erase most online hate from Jon Acuff and good to remember! I enjoyed these 20 pillow talk questions to ask your children when you are putting them to bed at night. My hubby and I laughed so hard looking at the photos here! 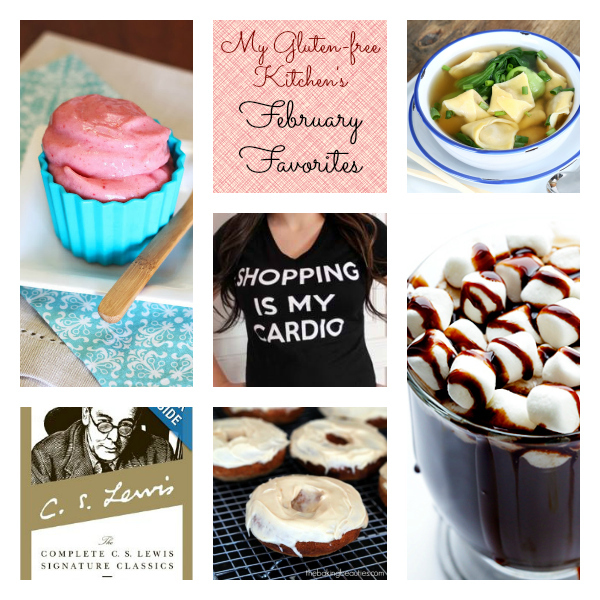 If you have any favorites from February to share with me, I’d love if you would comment! I’d love to check them out! I always find something to love that you post Jeanine! Hope you enjoyed some of the articles too! We made homemade hot chocolate recently using almond milk as the base, and it was really good! Definitely worth the, what, five seconds of preparation? Thanks for sharing those “10 words that erase most online hate”! I tend to choose relatively positive online discussions to participate in, and as a blogger have been fortunate (or boring) enough not to attract hatred for my posts, but it’s still a really good reminder. I bet almond milk would be great in this too. Glad you liked that article. I try to avoid the more controversial posts as I do not have a very thick skin! Hey Michelle! Thank you for stopping by my blog and commenting! I’m new to your site as well. I really love this post and hearing about your top 5 various things of the month. What a fun idea! My husband took a CS Lewis class in college, so we have most of his work too. That would be an awesome bookclub. Also I am eyeing that pillow talk book. great idea.